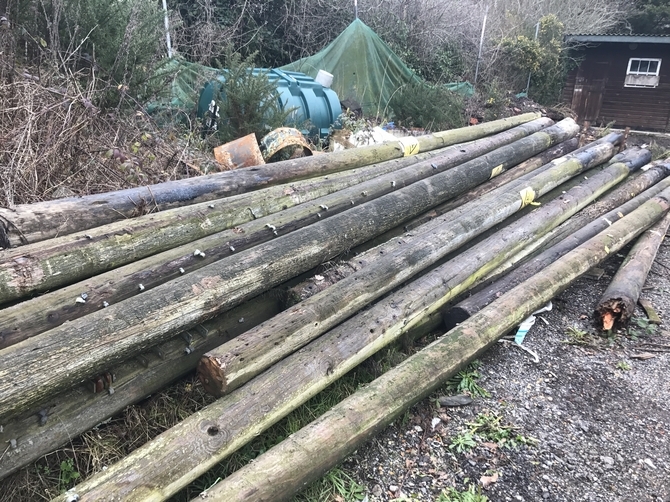 Reclaimed Telegraph poles from Ace Reclamation, the South Coasts leading supplier of Railway Sleepers, Reclaimed Railway Sleepers and New and Reclaimed Sleepers for your garden or home. 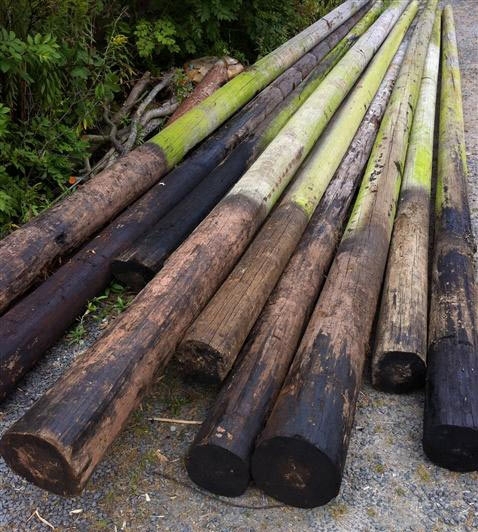 We have a large selection of reclaimed 30ft telegraph poles just arrived. They are tapered and will vary in diameter. Telegraph poles are simply tree trunks that are de-barked & mildly planed. Not only is every pole different in dimensions from each other (like each tree) but also they are tapered along the length. So the diameter of a used telegraph pole can vary by several inches, or 50mm or more from top to bottom. In addition the very end of the pole (the original base of the tree) can broaden out even more. So, if you are looking for regularity and identical poles forget it ! For calculating projects using multiple lengths of pole positioned vertically, allow a very rough average diameter of about 150mm - 200mm. It would be impossible here to list all the things that people have created with used telegraph poles. Raised beds (poles stacked horizontally, or cut & placed vertically side by side) Stepping stones and steps, Supports (to sit sheds on, or fasten decking to) Borders & dividers (beside drives, grass) Pathways (e.g. 6" slices recessed into ground) Outdoor lintels, Roof supports, Agricultural and equestrian buildings, Pole barns, Pillars for arbours and walkways, Jetties, Pond edging, Gate & Fence posts, Horse jumps etc..